DART (which stands for Dublin Area Rapid Transit) is one of the most convenient forms of public transportation in Dublin if you plan to travel from north to south (or vice versa) along the coastline of Dublin Bay. The light railway primarily serves the suburbs and is a much faster journey compared to traveling by bus. While DART might not be all that useful if you never plan to leave central Dublin, the local train system does present a great way to reach some of the most interesting tourist sights just outside of the city. It is also ideal if you are staying in the towns outside of Dublin and want to come into the city (though be prepared to join the crowds of commuters who have the same idea at rush hour). DART trains connect to the LUAS (Dublin’s urban tram) at Connolly Station and to suburban and intercity services at several other stations as well. Here is a guide to how to make the most of DART while in Dublin. Tickets for the DART must be purchased before boarding the train. Tickets for single, return and multiple journeys can be bought at ticket machines in all stations or online before the trip. Manned ticket counters are only available in some of the major stations. The price of a single ticket depends on the distance between the starting and ending station. A single adult ticket from Connolly in central Dublin to the end of the line in Howth is €3.30 one way or €6.25 for a return trip on the same day. An all-day adult ticket can be purchased for €12, or if you are traveling as a family you can purchase an all-day ticket for €20 to cruise the rails. Monthly tickets are €154, and make the most sense for regular commuters. For shorter tourism-related trips, there are three-day passes (€17.50) and seven-day passes (€29.50). The LEAP pass is an integrated pass that offers discounts on all forms of public transportation in Rome, making each single journey a bit cheaper. 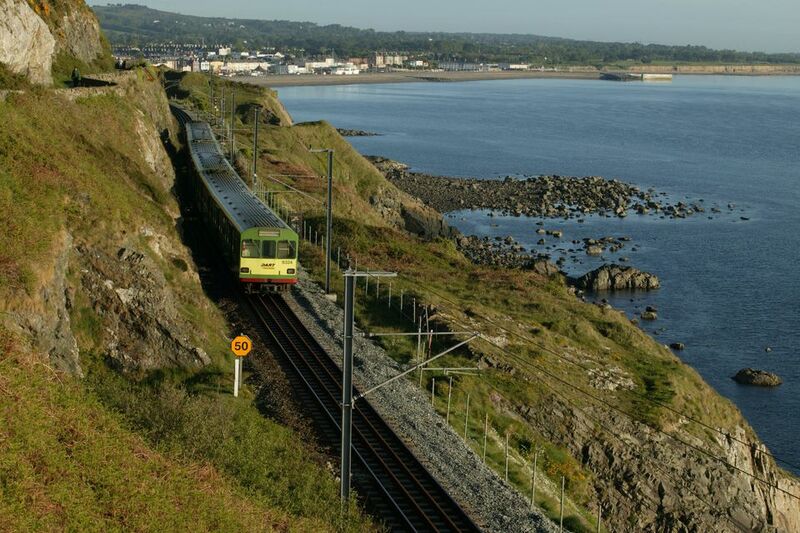 DART serves central Dublin and the coastal suburbs to the north and south of the Irish capital, reaching from Howth to Greystones in Co Wicklow. The trains run every fifteen minutes during the day, and schedules can be found online or posted in each station. The line runs north and south and splits at just one station (Howth Junction), so there is no need to worry about overly complicated transfers, simply be sure to pay attention to the final destination of the train to ensure that you are headed in the correct direction. Be sure to have a valid ticket before boarding the train as they are not for sale on board. If you are planning to explore Dublin city center, the best DART stops are Pearse, Tara or Connolly stations. Every stop (not only these central stations) also has bus connections to help you navigate the capital. Head to the Malahide DART station to visit Malahide Castle (one of the best castles in Ireland) as well as the botanical gardens. Disembark at Portmarnock for an Irish beach day. The DART stop close to Velvet Strand – the area’s most popular beach.